EXCLUSIVE LIMITED ONE WEEK ENGAGEMENT! 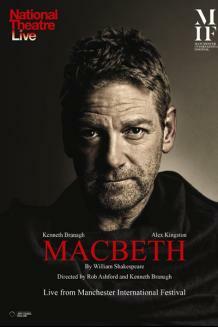 National Theatre Live will broadcast Manchester International Festival’s electrifying production of Macbeth, with Kenneth Branagh (My Week With Marilyn, Hamlet) in his first Shakespeare performance in over a decade as Macbeth, and Alex Kingston (Doctor Who, ER) as Lady Macbeth. Directed by Olivier and Tony Award-winner Rob Ashford (Anna Christie at the Donmar Warehouse, Thoroughly Modern Millie on Broadway) and BAFTA Award-winner Kenneth Branagh, this unique production of Shakespeare’s tragic tale of ambition and treachery unfolds within the walls of an intimate deconsecrated Manchester church. Kenneth Branagh has long been lauded as one of the great Shakespearean interpreters. His skills as a writer, director and actor have garnered international acclaim across the disciplines of stage, film and television, and he is the only man to be nominated in five different categories for an Academy Award. He last performed Shakespeare when he played Richard III at the Sheffield Crucible in 2002. Recent stage performances as Edmond at the National Theatre and Ivanov for the Donmar played to great acclaim. In 2011 he completed a sell-out run of the hit comedy The Painkiller at the Lyric Theatre in his home city of Belfast. Alex Kingston won critical acclaim for her numerous television roles including Dr. Elizabeth Corday in ER and River Song in Doctor Who. A former member of the Royal Shakespeare Company, performing in Much Ado About Nothing, King Lear and Love’s Labour’s Lost amongst others, Kingston was recently seen on the London stage in Luise Miller at the Donmar Warehouse. In 2006 she played Nurse Ratched in the West End production of One Flew Over the Cuckoo’s Nest starring Christian Slater. Recent feature film credits include Sweetland opposite Alan Cummings and Alpha Dog, starring Justin Timberlake. Rob Ashford has directed and choreographed productions on both sides of the Atlantic. From collaborations with the Donmar Warehouse and National Theatre, to Broadway, Ashford has a string of nominations and awards to his name including an Olivier Award for Anna Christie and nominations for A Streetcar Named Desire and Parade (Donmar Warehouse) and a Tony Award for Thoroughly Modern Millie and nominations for productions including Evita and How to Succeed in Business Without Really Trying. He also won an Emmy for his choreography at the 81st Annual Academy Awards.